Minor uproar has greeted this blog’s revelations that almost a fifth of the land at Ashton Gate pencilled in by Bristol City FC to become a Tesco Extra belongs to Bristol City Council. And even by the extraordinarily low intellectual standards displayed by Bristol City Council senior officers, this hare-brained scheme to give away a two acre car park at Ashton Gate to multi-millionaire City Chairman Stevie Lansdown without anyone noticing operates at an entirely new level of stupid. The fact that the land is openly listed in Lansdown’s Tesco planning application (pdf) as city council land and features on the council’s publicly accessible ‘pin-point’ map of council-owned land (above) seems to have entirely escaped the combined brains of the council’s planning department, who have apparently been quietly negotiating their “secret” land giveaway since January. And you don’t have to look too far to discover the council officer responsible for trying to do a multi-million pound favour for a wealthy developer with our land. Lansdown’s planning application also tells us that from February to July 2009 the applicant (i.e Lansdown) was receiving pre-application advice in the form of meetings and correspondence with planning officers Richard Matthews, Zoe Willcox and … Wait for it … David “The Bald” Bishop. Bishop must have known then. This is, of course, exactly the same David Bishop who was caught selling protected public park land over the telephone to Merchant Venturer George Ferguson just last year. So the city’s Lib Dem leadership – who appear not to have been told about the Ashton Gate land by Bishop – can’t say they weren’t warned can they? Now – surprise, surprise – the Lib Dem administration are right up to their necks in it. Having spent 3 months assuring us that the Ashton Gate Tesco was solely an issue for the “quasi-judicial planning process” over which they have no influence, we now learn that they have to take a highly controversial and unexpected political decision at short notice on whether they sell our land to Lansdown or not. Once again Bishop’s been allowed to brazenly manipulate the city’s democratically elected representatives and its citizens into a corner on behalf of a wealthy local developer. And just like the Chocolate Factory, he’s deliberately planted a controversial public land sale bang in the middle of the planning process, leaving politicians with little time or room for manouvre and under huge pressure from – on one side – financially powerful developers with legal muscle and – on the other side – the public. I wonder, how long will it be before we start hearing about an “in principle” agreement to sell the land is in fact in place after Bishop’s various discussions with Lansdown over the year? On what other basis would Lansdown have put in a planning application on the land? Although surely, as with the Chocolate Factory, the Ashton Gate car park sale should have been decided long before a planning application ever saw the light of day? Why didn’t our politicians ensure this Ashton Gate land deal was sorted and above board after the well-publicised and highly embarrassing Chocolate Factory debacle? Instead they seem to have let Bishop’s sharp practice go completely unpunished on that occasion, no doubt giving the slimeball the impression he was untouchable. It rather suggests our politicians are not really in control of this city and they are definitely not in control of the city’s Head of Planning, David Bishop. Perhaps they should have just got rid of him when they had the opportunity last year? The Lib Dem leadership, meanwhile, appears to have disappeared into a bunker to lick their wounds and study plans to figure out exactly how far up the garden path they’ve been led by their own officers. I wonder when they’ll get around to telling us what deal David Bishop’s negotiated for us on the quiet with Lasnsdown? Meanwhile yesterday, Jon Rogers surfaced on Tony D’s blog claiming that the public had been fully CONsulted on and informed about this land sale. An extraordinary piece of baloney considering Rogers and the Lib Dems are yet to even get around to formally acknowledging they own this land let alone formally announcing it’s on sale. Does Rogers think a story last Sunday on the Bristol Blogger now constitutes a formal Bristol City Council announcement? Is the pressure driving Rogers even more bonkers than he was already? This entry was posted in Ashton Vale, Blogging, Bristol, Bristol South, Developments, Environment, Lib Dems, Local government, Merchant Venturers, Planning, Politics, World Cup 2018 and tagged Ashton Gate, Bristol City FC, Chocolate Factory, David Bishop, Jon Rogers, Richard Matthews, Steve Lansdown, Tesco, Zoe Willcox. Bookmark the permalink. I was vaguely looking at Kerry McCarthy and Jon Rogers argue on Twitter in the way redundant, middle aged losers do and was trying to think of who I’d like to win in a fight. Instead I’d like to run them both over with a train. Looks like BCC should be negotiating to buy the land from the club at a knockdown price. Since the public control the access rights, it appears that the club have got themselves a “stranded asset”. Whoever controls the access controls the development potential. The council land agents should have the club over a barrel! Lets offer them £4M and build some houses there if the club still want a new stadium. They’ll be wishing they’d trousered the £5M supposedly offered for housing. Come on Council! Have some market forces for breakfast tomorrow and get to the negotiating table. Unlike all those experts down at the Council House you obviously don’t understand how market forces work here in Bristol do you? A free and open market consists of a private telephone line with planning boss David Bishop at one end and a wealthy local businessman at the other. They then make a deal and set a price agreeable to the businessman in secret and never tell anyone what it is. What could possibly be better or fairer for us than that? And it must be all right because we pay the council’s “strategic leadership team” about £2m a year and they’ve all been to business school so are experts in business aren’t they? I’m suggesting residents haven’t had a chance to feedback on the land sale. You haven’t even got around to announcing it yet. And just to jog your memory, the planning application is being heard in 7 weeks. Why didn’t you announce the land sale 6 months ago and allow a decent period of time to discuss this extraordinarily complex issue? When were you told a about this piece of land Jon? Look, everything is just fine – council officers merely take their lead from the Chief Exec Ormondroyd and therefore do not need to be accountable. Just out of interest, do BCFC pay rent on this land or what? But council Deputy Leader Simon Cook told Original 106.5 it was “absolutely wrong” to suggest the council could not make an independent decision. As a previous chair of land at the council I would suggest that it would not be right for Jon Rogers as exec for planning to consult on a land sale. That job should fall on whichever executive member is responsible for department which owns and rents the land. I am not sure who that is -unless of course it is held under the planning directorate when the responsibility would fall to whoever is responsible for corporate services. However it is not clear that anyone has consulted about the sale from what BERATE are saying. Previously on this Blog Gary Hopkins has said that this site is not suitable for a TESCO, if that is the position of the council, they can frustrate the development by withdrawing their land from sale to TESCO. If that it the case surely they are taking the planning fees from BCFC/TESCO (whoever is paying) in bad faith as whatever the planning decision was the council effectively has a veto over the development. The question is not the one answered by Simon Cooke about influence over the planning decision (he is right that it would not be legal to take a political decision to oppose a planning application) but they should come clean over if the planning application was agreed would they sell the land. Now, while the cabinet portfolios are fairly confused and only bear a passing resemblance to the “strategic leadership” roles, it seems finance and property are currently listed as the responsibility of Jon’s leader, Janke. So it’s a bad week for Jon then. First it’s revealed he’s been royally shafted by David Bishop, now we discover he’s taking the bullet for his boss on the land sale. Ouch! As for your Cook quote Jon. It’s all about the planning application. I’ve told you three times that the land sale and planning application are separate issues. Still you insist on conflating them. Is that because they are conflated? At this stage should we just assume an “in-principle” agreement to sell is already in place if planning permission is granted? Hope not. Because there’s a few constitutional issues there isn’t there? The land is obviously worth over £500k so where’s the cabinet decision to sell? You can’t sell it (or give it away) without one can you? BCFC have a 125 year lease to use the land as a car park only. They paid £25k for it in 1985. That works out at £200 a year, which means it’s cheaper for BCFC to rent a car park for a week off the council than it is to park our cars for a few hours in a council-run car park. They’re all business at the Counts Louse aren’t they? Not for nothing are they called ‘Bristol City’ Council, eh? Seen the answers to the public at council questions tonight – the answers to Roy Norris are particularly bizarre – all questions refered to a non answer to a question that isnt really related. Norris and Tony Dyer were also censored. Due to former Lib Dem Councillor, Dennis Brown’s endless speech from the public gallery for no reason they weren’t allowed to ask further questions due to the ex-cop, racist Lord mayor claiming they were out of time. Of course they could have owned up to the facts that were overlooked and come across as honest and reasonable, but looks like they want to filibuster, spin hard and hope not too many people notice. The answers given were, literally, incredible. We know that that the football club is basing its whole business case for building a new stadium on realizing the maximum value from its sole asset, the Ashton gate site – including that part of it owned by the council. Now the council is telling us that “no value has been placed on this land at present”. So how do they make the sums stack up, if there’s a dirty great £????? in the middle of them ? If Mr. Lansdown or Tesco found themselves in the position our council are in they, as business people, would hold out for the highest price for this land claiming they owe it to their shareholders. Well, i’m a shareholder in this council and I want the same rules applied. Somewhere north of 5 million would be a good starting point. I am now genuinely confused about what is happening here. If the planning app is agreed than do the Council have to sell the land? Or can they decline, therefore scuppering the application? Or do they have to make a decision about any sale before the planning app is heard, as obviously without a sale the development cannot go ahead? When City have been talking about the total amount they need to raise for the new stadium, have they been including proceeds from the council-owned land? Im no expert but at last nights meeting it was said that the land would not be sold until after the planning application. There would not be a consultation on the sale. I thought Simon Cook said they don’t do consultations on land sales but I thought that that’s exactly what was proposed for the Chocolate Factory land. Thanks Paul – so does it appear that if the planning app is approved they HAVE to sell the land? Anyone can make a planning application, regardless of whether they actually own a piece of land. I can apply to build flats on College Green if I want. If the planning application is approved BCC don’t have to sell the land at all. However, with planning permission for a Tesco the car park land would be even more valuable – at least £5million if the entire site is worth £25million plus. So if the land is sold after the application is approved will BCC receive the £5million plus as the owners? Or will they slyly transfer this loot to BCFC? If, rightly, BCC receive the £5mill from Tesco that means that BCFC will receive far less than they originally anticipated for their sole asset. Along with many others, I’m extremely worried that the land sale/value and the planning application are being deliberately conflated by the Council and that they will end up donating an asset worth over £5million to one of the richest men in the West Country – shafting the rest of us in the process. The problem of mixing up controversial land sales with planning permissions is illustrated by the Chocolate Factory. By the time permission is granted the developer has a great deal of legal weight and financial momentum behind them and massive positive PR opportunities. It is also often the case that the planning officers dealing with the case are in favour and can “pull strings” in terms of land sales. The moral of the story is that the council should be made to openly and fairly decide on land sales prior to any planning application. This is a simple and effective policy that councillors could introduce if they were really in favour of handing power to communities and all that other local democratic guff they talk. In the particular case of Ashton Gate, we don’t know if planning permission definitely leads to land sale because we don’t know if an “in principle” agreement to sell exists – as was the case with the Chocolate Factory. Cook, last night, gave the impression the cabinet would decide and that no such agreement existed. But he was very shifty over the whole affair – as have been the Lib Dems generally. They’re behaving like they’re basically, for some reason, in the pocket of Lansdown/BCFC/Tesco. We should be keeping an eye on donations shouldn’t we? Excuse my ignorance in these matters, but what’s to stop BCFC sub-letting the lease for that little bit of land, or even transerring the lease to Tesco once planning permission has been granted ? Is that bit of land to actually be built upon or is it to remain a car park ? As I say, do please excuse my ignorance. We don’t whether the lease is transferable or not, or whether it allows subletting. What we do know is that the lease is restricted to the use of the land for parking. The development plans show that the intention is to build a Petrol Filling Station on the land in question which is inconsistent with the existing terms of the lease. That “little bit of land” is large enough to provide 45 council homes at the density levels consistent with the Southville area. Only a week ago, the council was given a grant from central government to build…guess what.. 45 council houses. Just two days ago, the council announced that its housing waiting list had reached 14,322. So if the land becomes available, the City Council could, at no cost to local taxpayers, give 45 families, some of whom have been on a waiting list for housing for several years, somewhere decent to live. Or they could sell it to BCFC/Tesco to be turned into a Petrol Station and car parking. 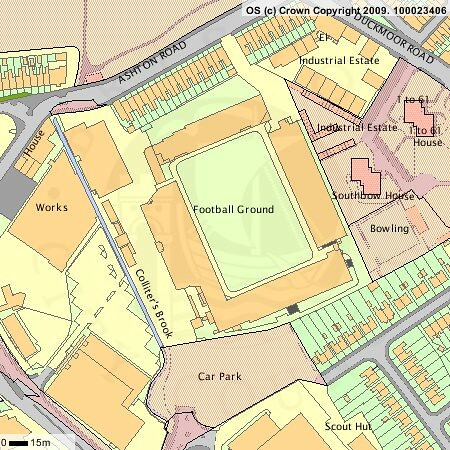 If Ashton Gate as a whole, including the car park becomes available, what should the priority be – another supermarket, or housing? The council owned land looks like it becomes the petrol station on the planning application, so in theory, although like you I speak mostly in ignorance of such matters, sub-letting or transferring the lease for that purpose would still require the changing of the original terms of lease by BCC. That, or selling the land. However, I’m sure highly paid people are this very minute being scrambled to figure out a way it can happen, so the scenario you paint could still come to pass. We shall scramble our pro-bono legal advisors to check it out. I’ve been resisting posting my views on this blog as I’m still receiving constituent’s views on both applications. I just can’t understand why the Lib Dem council, professing its green credentials, cannot use this ‘ransom strip’ to encourage a mixed development with retail, residential, workspace and leisure uses on this iconic site instead of an indenti-kit red shed. That was the core of our (Labour Cllrs) letter to Tesco – now it seems the Council have had the clout to make this happen all along but are simply scared of doing anything. My party gave Bristol leadership, the Lib Dems, even with a majority, give it drift, hide and confusion. I feel genuinely sorry for Jon – when I was exec member no one would have snatched my portfolio from under my nose. As I have intimated elsewhere, my portfolio includes planning and Simon Cook’s includes capital projects. “Planning” and “land sales” are kept separate. Mark, your record on the Greenbank Chocolate Factory land sale wasn’t exactly exemplary. May I refer you to the old saying about pots and kettles? Right, so you’re planning, Simon Cook is land sales. What about Gary Hopkins? Why is he getting involved? Just because Mark and Labour were wrong about Greenbank, doesn’t make Jon and the Lib Dems’ wrong decision about Ashton Gate the right one. the car park was used for filming market shots on Only Fools And Horses! Jon – pleased to hear it but didn’t seem that way on tuesday. 69 queries in 1.315 seconds.